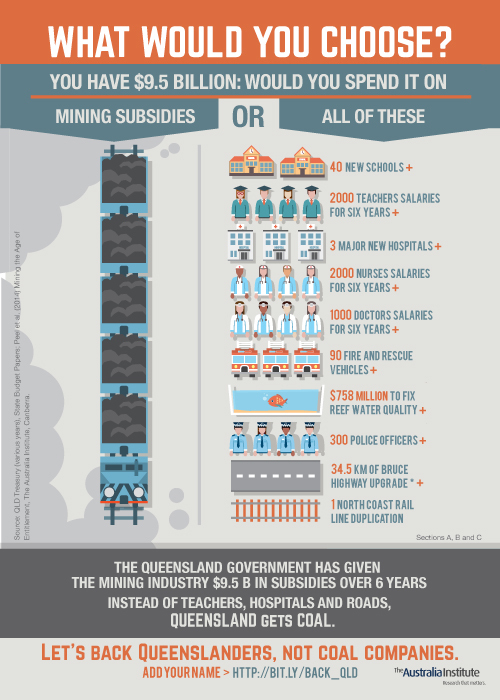 Our research over six years (2008/09–2013/14) shows that Queensland spent $9.5 billion in taxpayer dollars on subsidies for the mining and fossil fuel industries over those six years; far more than any other state. $8 billion taxpayer dollars of that went to coal alone. During that time, Queensland’s spending on services, like hospitals, schools and social housing has trailed behind the rest of the nation. And now, the Queensland Government want to give free water and free coal to Adani, and the Federal Government want to throw in a free coal-only rail line to boot. Every dollar spent on coal handouts is a dollar that can't be spent on schools, teachers, hospitals or any other services. The coal industry claims that these handouts create jobs. Education, tourism, agriculture, health – and even the arts and culture sector employ more people than coal mining. Our research shows that taxpayer subsidies for big mining make no economic sense: mining produces fewer jobs per million dollars output than almost any other industry. Let’s back Queenslanders, not coal companies. It's time for No New Coal Mines. "Queensland has been amongst the lowest in state spending on social services in Australia. But when it comes to spending money on handouts to the mining and fossil fuel industry - no other State can beat Queensland. "Every dollar the Queensland government spends on handouts to coal companies is a dollar that can't be spent on schools, teachers, hospitals or nurses. "Premier Palaszczuk, let's back Queenslanders not coal companies. End subsidies to the coal industry."